As many of you are already aware, we recently started taking preorders for several of our machines with Windows 8. Out of our new products, one that has probably generated the most buzz was the XPS 12, a convertible Ultrabook that combines the power of a laptop with the convenience of a tablet. Our engineering and design teams started with the same approach that has made the XPS 13 such a success: to build a solid, high-performance product by using premium materials and merging them with the latest available technology. Premium materials help make the system look great, but our design teams also chose materials for real functional benefits in terms of weight and durability. The XPS 12 starts at 3.35 pounds thanks to design choices like carbon fiber found on the back of the panel and on the base of the system. In addition to keeping the system light, the carbon fiber base also keeps the base comfortably cool when you’re using it on your lap. Our design teams chose machined aluminum for the frame because of its rigid properties, providing a solid framework for the flip hinge panel design. Corning Gorilla Glass is bonded to the panel for added rigidity. I recently got a chance to spend a little time with one, and I can say I noticed a couple of things right off the bat—that Windows 8 touch interface works really well, and that this machine offers some pretty solid performance because it is a full-blown laptop. Just as reviewers like Walt Mossberg have noted, touch performance in Windows 8 is stellar. It’s clear that the operating system was built with touch as one of the primary ways of interacting. Coupling that with the 10-finger capacitive-touch display results in snappy performance in a number of tasks. So whether you’re scrolling through the Windows 8 home screen, scrolling up or down a web page or pinching and zooming on images, you’ll notice the responsiveness. Update from Lionel: Click on either of the images below to see a larger version. 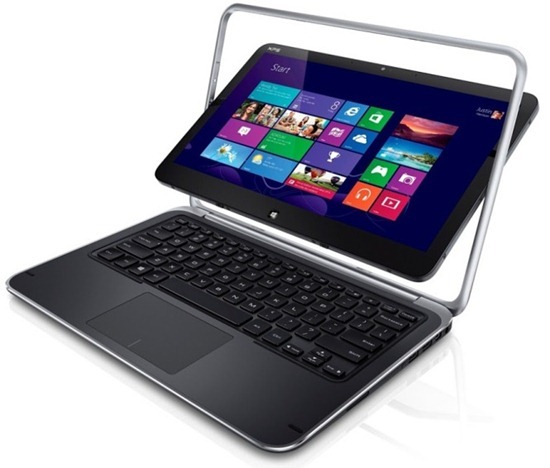 To see more pictures, take a look at the XPS 12 Convertible Ultrabook album on Dell’s Google+ page. Since the XPS 12 is based on Intel’s Ivy Bridge technology with processor options up to the Core i7 and the integrated HD 4000 graphics, it makes sense that performance is solid across any laptop-specific tasks you need to tackle. Productivity tasks like editing a presentation or a Word doc are as quick as you’d expect. Same goes for watching videos or streaming videos on services like Netflix or Hulu. Beyond the effectiveness of touch and the great overall performance I noticed, there’s a lot to like about the screen as well. The -full HD (1920 x 1080) display supports –wide viewing angles up to 170 degrees, which means that the screen looks great from almost any angle. In other words, you can look at it from the side and still see the slick Windows 8 tile interface in great detail. The brightness and clarity of the display is noticeable as well. It’s rated at a brightness level of 400nits. 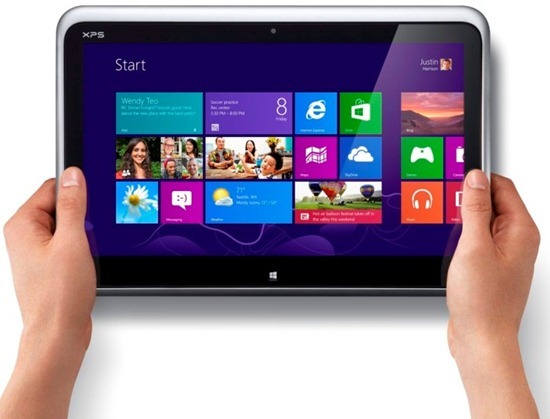 The glass integrated touchpad builds on the multi-touch gesture capability that we first introduced with the XPS 13. And since this machine is designed for Windows 8, our teams worked hard to deliver a consistent Windows 8 touchpad experience on the XPS 12 and other products. In a future post, I’ll sit down with a key member from that team to explain Dell’s approach in more detail. The XPS 12 utilizes a built-in 47-watt 6-cell battery. Based on our labs updated tests using the new MobileMark 2012 industry benchmark, users can expect –up to 6 hours, 7 minutes* of battery life in typical use, according to our labs’ testing. For customers in the United States, the XPS 12 comes with Americas Best Warranty, which includes one year In-Home Service after Remote Diagnosis, and one year Premium Phone Support. See previous link for more details. Business customers who buy the XPS 12 can opt for our ProSupport service. XPS 12 configurations will vary by region, but all configs come with SSD drives. Those drives work together with technologies like Intel Smart Response, Rapid Start and Smart Connect technology for fast boot times, and keeping your email inbox current, even when the system is in sleep mode. The fact that the XPS 12 runs the 64-bit version of Windows 8 in all configurations means you can run many of the applications you’re used to running in Windows 7. But it also means you can run Windows 8 apps (the ones that like Live Tiles in the screenshots above) either in tablet mode or laptop mode. We’re also including an app called “Getting Started with Windows 8” – a video tutorial designed to help you navigate the most basic operations in the new Windows 8 user interface. This includes basics like shutting down the system, pinning an app and accessing Charms. The XPS 12 is currently available for preorder in several countries like the United States and Canada, UK, France and Germany. It will be available in more countries soon. Pricing for customers in the United States starts at $1,199. For more details on our convertible laptop, check out the XPS 12 product page on Dell.com. I welcome your questions in the comments below, or you can ask me via @LionelatDell on Twitter. *battery life: Tested system equipped with 4GB memory, Intel HD 4000 graphics, Intel Core i5-3427U, and 128GB SSD. Based on testing using the Mobile Mark 2012 battery life benchmark test. For more information about this benchmark test, visit www.bapco.com. Test results should be used only to compare one product with another and are not a guarantee you will experience the same battery life. Battery life may be significantly less than the test results and varies depending on your product’s configuration, software, Usage, operating conditions, power management settings and other factors. Maximum battery life will decrease with time and use. Thanks for the review. I am very interested in the XPS 12, as it appears to have accomplished the merging of laptop and tablet functionality into a single device more elegantly than other manufacturers. I think Dell needs to take a more forward approach in addressing the reliability of the swivel hinge design on the XPS 12. I have to say, this feature–key to the operation of the device–was an immediate concern to me. In fact, I completely ignored the device for the simple reason that the hinge design LOOKED problematic. I have already encountered other people with a similar concern. I have since learned that this is not Dell's first foray into the field of convertible laptops. having previously released the Inspiron Duo. That device apparently utilized a similar swivel hinge design, but lacked the capabilities of Windows 8 that are now present.. Furthermore, a video review by LaptopMag states that the swivel hinge has been tested some 20,000 times to prove reliability. Can you vouch that this is true?